The high-end loudspeaker market is populated by numerous designs, ranging from conventional, which utilize expensive, top quality components and careful voicing, to unique designs, which attempt to use unusual means to deliver superior performance. Sometimes, unconventional speakers work extraordinarily well. On the high end of the price spectrum, speakers such as the Avantgarde horn speakers are designed to produce the highest quality sound output possible. On the lower end of the price scale, manufacturers such as nOrh successfully use different design strategies to provide sound quality equal or superior to almost anything in its price class. The Ikonoklast3, manufactured and distributed by Warren Gregoire and Associates LLC, is a new loudspeaker that utilizes not one, but several unique design features that distinguish it from offerings by other manufacturers. By using such offbeat design specifications, the Ikonoklast3 is an attempt to provide better performance than others within its price range. The Ikonoklast3, designed and built by Warren Gregoire and Associates, is basically a medium-sized box, measuring 61cm high, by 22cm wide, by 30.5cm deep (24 x 8.5 x 12 inches). Four adjustable spikes are included with each speaker to provide a solid base, even on thick carpet. The spike adjustment also allows the speakers to be tilted to achieve best tuning in a given listening environment. One pair of gold-plated binding posts is located at the bottom of the cabinet back side. On top of this conventional appearing box, is the first indication that the Ikonoklast is anything but - CENTERed near the front edge of the top of the cabinet is a dual Walsh-type, 360-degree, coherent line, metallic tweeter enclosed within a cylindrical, wire cage. The dual, cone-shaped tweeters, looking something like aluminum ice cream cones, are situated with their pointed ends together. 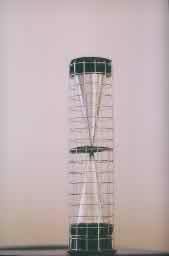 The cage, measuring 5cm diameter by 23cm high (2 x 9 inches) stands on end. The manufacturer claims they have reduced moving mass of the tweeter "to only about 1/25th that of the finest voice coil, dome tweeters". They have designed this tweeter to be fast and accurate in sound reproduction with wide dispersion and a frequency response up to 40kHz. A single, 13cm (5 1/4 inch) mid/bass cone driver is CENTERed near the top of the speaker baffle. The mid/bass driver appears to be excellent quality. The cone membrane is made from a mix of carbon fiber and Kevlar® in an acrylic polymer gel. The voice coil is edge-wound copper. Again, the designer has opted for low moving mass; specifications indicate that total moving mass for this driver is a mere 5.9 grams. The driver chassis is a low-resonance, die-cast design. The mid/bass driver has a small, circular disc that screws into place in the middle of the driver phase plug. Two other sizes of discs are included in the speaker shipping box, one pair smaller, one larger than standard. Changing the discs resulted in subtle but appreciable changes to the sound of the mid-frequencies. They can be used to tune the Ikonoklast3 to a particular system and room. A 5 1/4 inch driver is not capable of producing adequate bass without substantial help from the cabinet. The Ikonoklast3 does not use a simple sealed or ported box; it would have been difficult with those designs to reinforce adequate bass from such a small driver without resulting in a very inefficient speaker. Instead, a 3/4-wave transmission line design is employed and efficiency of 95dB is attained. Generally, a 1/4-wave transmission line design is conventional. Warren Gregoire and Associates chose to use a 3/4-wave design to extend the useful low end to a claimed 30Hz. In addition, these speakers have no crossover network. The tweeter is designed to roll-off as it approaches its lower limit, near the upper range of the mid/bass driver - the mid/bass driver is designed to roll-off at the top of its range. According to Warren Gregoire and Associates, the drivers are carefully designed to complement each other and require no crossover network. In this manner, the potential for capacitors and other components to smear musical detail can be avoided. Since there is no crossover, bi-wiring is not an option. The Ikonoklast3 loudspeakers were designed to provide maximum detail possible from a loudspeaker and allow low bass extension with high efficiency. As such, they require the best available source, preamp, and amplifiers. If an ordinary source was used, such as a normally acceptable moving magnet cartridge, the Ikonoklast speakers would simply showcase everything that was undesirable about that cartridge. In the end, not only did evaluation of these speakers require the best components available, they also required a great deal of setup time. The Ikonoklast speakers seemed to be at their best in a small room, with nearly square dimensions and a low ceiling. They also seemed to sound best when played at relatively low volume. The Ikonoklast3 loudspeakers are as detailed as any speakers I have heard. Musical notes that are smeared or lost with most speakers are easily heard and clearly discernable. In fact, not just music, but all recorded sounds become more obvious. Details are so precise that the sound of wooden sticks pounding on drums are nearly as clear as the drums. The sound of fingers moving on stringed instruments is so clear and strong it is almost distracting. This level of detail allows musical notes that previously may have been missed to stand out clearly. With live recordings, such as the wonderful RCA Living Stereo LP of Harry Belafonte Live at Carnegie Hall, the recorded audience seems to be in the listening room, not a part of the recording. Hushed coughs and whispers seem to emanate from somewhere within the room, away from the instruments and singer. This effect has been noticed with other speakers in my listening room, but none so sharply defined as the Ikonklast 3. Detail is reproduced with exceptional clarity by the Ikonoklast3 speaker. One obvious reason for this level of detail is the unusual tweeter used in the Ikonoklast. Additionally, the lack of an electronic crossover, with its potential for smearing and blurring recorded information is at least partially responsible. Finally, fast, accurate bass transients provide low range detail seldom heard in stereo loudspeakers. This can be credited to the small, high quality mid/bass driver and the benefits of an acoustic transmission line cabinet design. Information found on the Warren Gregoire website and included in the speaker literature states that Ikonoklast3 speakers have very clean, deep bass (down to 30Hz) that is true to the source, not only in tone but in accuracy of bass transients. These claims are generally true - with one major caveat noted below under "Negative Impressions." Notes down to 40Hz were cleanly reproduced. The Ikonoklast3 speakers produce bass in a quick and lively manner that sounds quite accurate in rhythm and timing. Due in no small part to the quality and size of the mid/low driver, the speed of bass reproduction is exceptional. Transient response is excellent, regardless of the percussion instruments in the recording. These speakers have greater bass detail than most loudspeakers on the market. Many speakers will produce a slight slurring of notes preventing the listener from distinguishing some individual bass notes. This is not a problem with the Ikonoklast3. Mids and highs were clean, clear, and superbly detailed. When these speakers are properly setup in an Ikonoklast-friendly room, female voices sound wonderfully natural. There was no evident nasal tone. Female voices, such as Sarah Brightman and Mary Black, sounded sweet and natural. The sharp detail of the Ikonoklast speakers added unusual clarity to their vocals. Pianos (above 200Hz) sounded particularly engaging - notes were sharp and clean on the attack, and tonally accurate during prolonged decay. Cymbals sounded correct from the first strike of a drumstick, to the last shimmering tone as they faded. The Ikonoklast3 loudspeakers have a very wide and deep soundstage. Holographic imaging within the soundstage is clear and precise. These speakers can reproduce sound from a well-recorded LP such as "Peace Pipes" by Arco Iris (Passport Records), and provide a splendid example of the type of audio imaging that multi-channel Surround Sound tries, but seems unable, to accomplish. In addition, the 'sweet spot' is relatively large - a listener can move around with much greater latitude than possible with most speakers and still experience the full effect of stereo imaging. With sensitivity of 95dB/2.83v/m, the Ikonoklasts can be driven by most amplifiers, including most flea-powered amps. A mere 4 watts per channel is sufficient to bring the Ikonoklasts to a sound level over 100 dB - much higher than necessary or desirable. As such, when played at a reasonable listening level, even very low-powered amps have sufficient headroom to play any type of music without worrying about dynamic compression. These are well built speakers. They are solidly constructed and well finished. The oak veneer on the test units was well applied with a smooth appearance and a silky texture. The tweeters were loosely attached to the top of the cabinet so they would pop off if struck, without causing any harm to the driver. The wire cage protected the delicate tweeters from accidental contact. However, the cage will NOT protect the tweeters from the probing curiosity of precocious toddlers. Despite the fact that the test units had been through other tests and shipped several times prior to this evaluation, they were still in very good shape. Warren Gregoire and Associates sell the Ikonoklast3 loudspeakers, as well as other products, factory direct. There are currently no dealers. They realize that many people will be in the position of needing to buy without ever having heard the speakers. As such, they have a 60-day return policy, with a 15-percent return fee. If you find that you cannot get the Ikonoklast loudspeakers to work for you, Warren Gregoire and Associates will be happy to take them back. This type of policy takes much of the risk out of purchasing untried products. Setup of this pair of speakers was difficult and time consuming. Placement of the Ikonoklast3 loudspeakers was absolutely crucial, not only placement within a room, but selection of a room in which to place them. 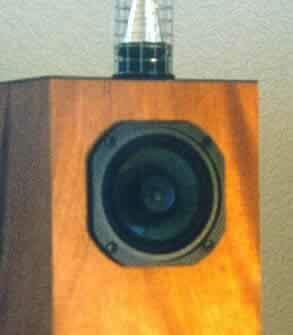 A room for the Ikonoklast speakers must not 'swallow' bass; it must be the right size and shape. Documentation explaining the Ikonoklast3 indicated that the best room size would be less than 350 square feet. My listening room is approximately 330 square feet with a slanted ceiling. These dimensions did not work well with the Ikonoklast speakers. Instructions included with the speakers clearly stated that the speakers must be placed at some distance, about one to two feet, from walls to prevent excessive reflection. I found the best distance in my system to be about four feet from nearby walls. Moving the speakers to other rooms revealed other aspects of the Ikonoklast. If the room is too small (100 square feet), the Ikonoklast speakers could not be placed far enough from back and side walls, which resulted in an unwelcome boost in certain mid- and high-frequencies. Additionally, when placed too close to a wall, detail became smeared and lost in reflections, and imaging suffered. The Ikonoklast speakers were tried in a variety of rooms, including a room not in my home. The argument can be made that most room problems can be fixed with proper room treatment. While this is correct, it assumes that everyone who purchases a set of Ikonoklast3 speakers will be an audiophile with a dedicated music room, or at least will have the resources and desire to spend time, effort, and money to sonically alter a living area to make it "Ikonoklast-friendly". Many potential purchasers may be such dedicated audiophiles, but many will not be. In all fairness, it must be remembered that many other speakers suffer from similar difficulties. For example, a $17,000 pair of Avantgarde Duos will sound flat and lifeless unless they are properly dialed into a system and room. Literature included with the speakers warns that the uninitiated may "think the bass may be lacking." Initial listening impressions revealed exactly that. Upon initial setup, the bass sounded so weak that the speaker cable connections were checked for accidental polarity reversal. As an experiment, the polarity of one cable was reversed. The result had little effect on perceived bass. However, a huge hole appeared in the middle of a diminished and flattened soundstage. The experimental polarity reversal was immediately corrected. After listening for a long time and becoming accustomed to the sound of these speakers, it was observed that all expected bass notes could be heard, but bass still had no visceral impact. With live music, even acoustical music, bass carries much more strength than what is produced by the Ikonoklast3 speakers. A live string bass or a cello vibrates the air and can be felt as well as heard - the Ikonoklasts merely let the listener know that a low note has been played. In the best achieved setup during this evaluation, there was no power and little emotion conveyed by the Ikonoklasts at low frequencies, even from the cello of Yo Yo Ma. In a better controlled environment, such as a sound studio, results may have been very different. When checked with a decibel meter, the Ikonoklasts didn't just seem to have weak bass. Below 200Hz, they were -5dB to -8dB compared to the rest of the frequency range in my listening room. In the best room tried, bass was only -2dB to -3dB at frequencies below 200Hz. Unfortunately, in the best room for bass reinforcement, there were spikes in the upper mid range and middle treble range that caused the speakers again to sound biased toward the upper end. Without proper room treatment, or a room that is acoustically well-suited for the Ikonoklast, they sound very bright and thin instead of rich and full. Prior to moving the Ikonoklast speakers to different rooms, then to a different location altogether, the question arose as to the suitability of chosen amplifiers, a pair of Decware SE84C Select amps, wired as monoblocs with only 4 watts each. To answer the question, different amplifiers were tried, including a modified Dynaco ST70 (35wpc), and a pair of nOrh Le Amps (solid state monoblocs, 100 watts each). While the sound of each amplifier was different, there was no significant improvement in tonal balance. As the Ikonoklast3 loudspeakers were designed to be used with SET amplifiers, all remaining testing was done with the Decware monoblocs. The reduced sound level below 200Hz had an interesting effect on human voices. While female voices were largely unaffected, male vocals suffered from the lack of low end. From the Riding with the King LP (Reprise Records), Eric Clapton sounded nearly normal, but just a bit thin. However, the deep, gravely voice of B.B. King sounded downright tinny, as though he was singing while standing inside a metal can. Leon Redbone, with his eccentric presentation and unique, baritone voice, was nearly unrecognizable, as a surprising amount of his vocal range was reproduced several dB below the rest of the music. A minor negative point concerns aesthetics. The Ikonoklast3 loudspeakers are well made and finished. However, some people found their appearance strange. The bulk of the speaker is simply a well-finished, wood-veneered box. However, the tweeter stands 23cm (9 inches) above the top of the speaker cabinet. This arrangement drew negative comments from some people who thought the high tech appearance of the tweeter was out of place, as though it was a completely separate and unrelated unit. The analytical detail of the Ikonoklast3 dictates that the quality of the source and all upstream components, including cabling, is vital. Any weak link will be highlighted by these speakers and demand repair or replacement. While experimenting, it was found that a Shure V15, which I normally enjoy, did not work well with these speakers. While the Shure seemed to reduce some of the brightness, it lost detail and liveliness compared to moving coil cartridges. A Benz Micro Gold, and a Dynavector DV20 X were tried, and found to be much more in line with requirements of the Ikonoklast speakers. However, the Benz Micro had somewhat less bass than did the Dynavector. Finally, an LP needs to be as clean and free of dust as possible, or the Ikonoklast speakers will distract the listener with every click and pop. Ikonoklast3 loudspeakers retail for $2,495 (USD) per pair. While this is not an outrageous price for loudspeakers with the features and build quality of the Ikonoklast3, these speakers must be compared to others in its price class. Similarly-priced speakers range from highly efficient, full-range, single-driver loudspeakers, such as the Edgarhorn Slimline, to lower efficiency, conventional, multi-driver units such as the Spendor SP1/2. Many, highly sought after, superbly-performing loudspeakers are available within the price class of the Ikonoklast3. There is much to like about the Ikonoklast3 loudspeakers. Their output is clean, clear, and wonderfully detailed. From bass that is sharp, very quick, and surprisingly deep, to highs that are crystal clear and almost ethereal in quality, the Ikonoklast reproduces every note, every sound that reaches them from the source. There is no problem with the speed of the drivers or the accuracy of transient detail produced by the Ikonoklast speakers. The problem, such as it is, lies with tonal balance. Measurements with a decibel meter in various test environments confirmed the drop in sound level with frequencies below 200Hz. 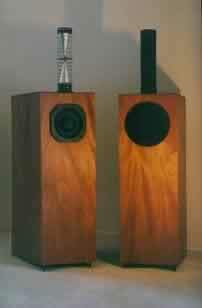 The observed tonal imbalance had a negative impact on the musical presentation of these loudspeakers. Four separate rooms were tried, and all were incompatible with the Ikonoklast speakers. If I had this problem, other people will, too. Using the best setup I could devise, I found myself listening for notes and sounds, analyzing the sound of the speakers, and trying to determine what they were doing instead of becoming engaged in the music. Despite some extraordinary aspects of their performance, seldom did I find music emanating from the Ikonoklast3 loudspeakers to be satisfying or involving. Results likely would have been more positive with better tonal balance, such as might be accomplished with a properly dimensioned room and appropriate acoustical treatments. The Ikonoklast3 loudspeakers are fascinating, unique, and seem to have great potential. However, unless you happen to have a room that is ideally shaped and sized, and you enjoy the challenge of tweaking the room acoustics to get them to perform to their potential, the Ikonoklast3 may not be the best choice. The Ikonoklast3 loudspeakers are not for everyone. However, if you are looking for the most detailed speaker that will bring out every note, every bit of musical information possible from a recording, and are willing to "go the extra mile" during setup, they just may be right for you. If there is one particular "design parameter" which we have attempted to optimize in Iknonoklast3, it is "musical involvement". We, therefore, are disappointed that Richard was not able to experience this, in his listening. But it must have been frustratingly distracting for him, trying to enjoy music with the lowest several octaves attenuated by 8 dB by his unfortunate placement of the speakers in his room. The solution I would have suggested, should I have been consulted, would have been to move the speakers closer to the wall behind them to reinforce the bass, and to provide treatment to the wall to absorb and/or diffract a portion of the rear radiation from the tweeter that was causing excess brightness. This "treatment" could consist of common everyday decor items, or blocks of poly-foam, or numerous other items. The tweeter radiates only in a 30-degree vertical arc, so only a small area may have needed treatment. Is it more of a hassle to set up Ikonoklast3 than typical front-only radiating speakers? Certainly. But a well known regular reviewer for a famous print publication has confided to me that he felt Ikonoklast3 came amazingly close, sonically, to his $15,000/pair reference speakers. At $2,500/pair for our product, would a savings of $12,000 motivate some people to spend a little time, energy and money (very little money) on adjusting room acoustics? Our experience suggests that there are such people. For those who desire less stringent placement requirements and control of room acoustics, we can supply a version of Ikonoklast3 which provides absorption of the rear radiation from the tweeter. It utilizes an alternate mid/LF driver with slightly lower sensitivity, to integrate with the diminished tweeter power response. Sensitivity is 92 dB and the price is the same. This alternate system typically delivers greater "apparent bass output" because it may be placed closer to the wall behind it. One of Ikonoklast3's main design features is the use of an unusual transmission line tuning alignment that virtually "tricks and cajoles" the diminutive midrange driver into reproducing frequencies down to 30Hz and below. It provides only a small amount of "bass you can feel", but it can be HEARD with unusual clarity, even at low listening levels (when the speakers are properly placed- typically about a foot or less from the wall behind them). Listeners who desire more visceral bass reproduction may add a sub-woofer with a small fiscal and bass clarity penalty. I prefer to listen without any sub-woofer. I wholeheartedly endorse almost all of Richard's astute observations about the strengths, weaknesses and characteristics of this system. Particularly pertinent is the need for extremely fine (read "expensive") associated components. Ikonoklast3 really should be viewed by potential buyers as "$15,000/pair speakers which can be purchased for $2500/pair". Signal sources and amplification must be of commensurate quality, or the sonic benefits will not accrue. Should someone suggest use of these speakers with a great $600 CD player and highly reviewed $1000 solid state amplifier, we shall recommend lower priced conventional speakers which will be less mercilessly revealing of the exact nature of the input signal. The extra bass, warmth and "pizzaz" are probably necessary to make such a system "listenable." Even our smaller less costly Ikonoklast7 (mini-monitor) which sounds very similar to Model 3, should be combined only with the highest quality associated components. We believe Richard's review contains one the most apt and accurate descriptions of Ikonoklast3 we could have hoped for. But we think he got off the track when he kept moving the speakers from room to room to find one which work. We feel they will work well in nearly ANY room smaller than 350 square feet, but typically they must be placed closer to the wall behind them than several feet, and any harmful tweeter reflections must be eliminated, as described previously. I would like to thank Richard George for his excellent review, and for this opportunity to respond. Photographs used in this review courtesy of Warren Gregoire and Associates. Many thanks to Mr. Gregroire and everyone else involved for providing the units used for this review. DuPont™ and KEVLAR® are registered trademarks or trademarks of DuPont or its affiliates.